Unprecedented public hearings by the people of Goa (82 hours over 8 days) against turning it into a coal corridor by systemic expansion of its Mormugao Port Trust and highway construction to import and transport coal. The Mormugao Port was commissioned in 1888 in the current south Goa district of Goa in India. The port is a central government agency, under the Ministry of Shipping, Government of India, and the administration is under the Mormugao Port Trust (MPT) . Coal dust has been a problem for the people of the nearby port town called Vasco da Gama for many years now. 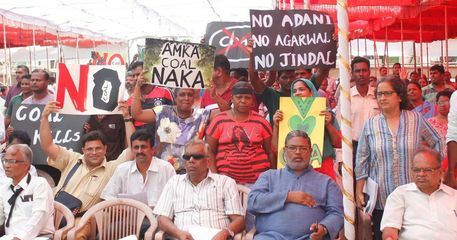 In 2012, after 11 years of judicial proceedings, since 2001 when resident Deelip Mandrekar filed a writ petition, the court closed two handling berths after declaring that coal dust was present in unhealthy amounts . 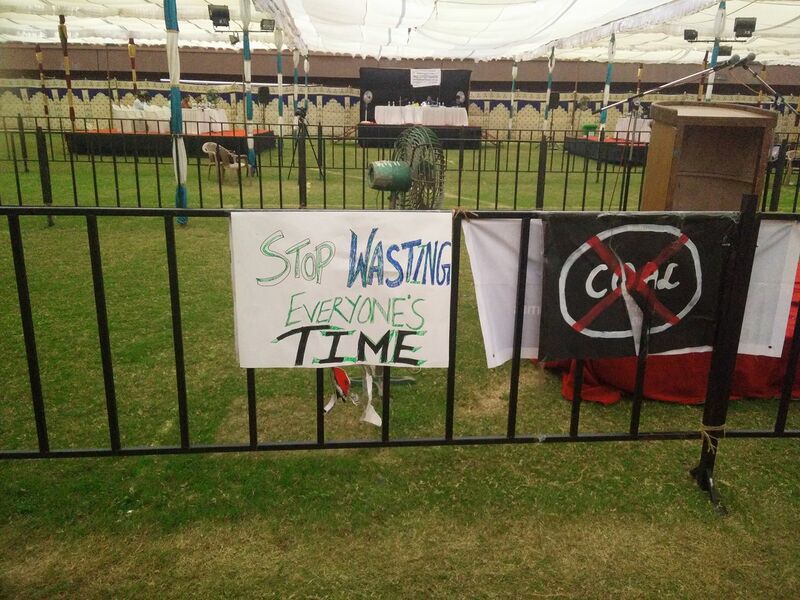 In 2016, the Goa State Pollution Control Board had taken cognizance of the ​​ air pollution and ordered MPT, Jindal and Adani to cut coal handling by 25%, and order which is still in force. However, in recent years the condition has only worsened. 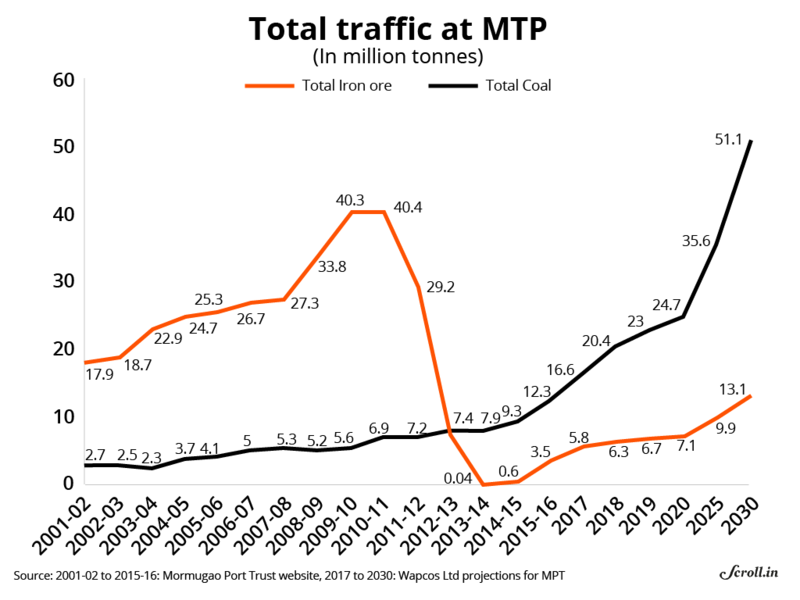 Currently more than 12 million tons of coal is imported by MPT, and there are plans pushing for expansion of four berths to accommodate a four-fold expansion at over 50 million tons of coal import by 2030; to facilitate the growth of steel industry in north Karnataka . According to the enquiry for a National Green Tribunal (NGT) case, it was found out that between 2014 and 2016 a series of decisions were taken to subvert environmental laws by misrepresenting facts and overruling fisherfolks´ resistance to push for these projects by the Union Shipping and Transport Minister Nitin Gadkari and the then Environment Minister Prakash Javadekar . According to the residents, the expansion of the port has resulted in a decline of monitoring by the Goa State Pollution Control Board . In December 2015, Gadkari took a “policy decision” to exempt the deepening of the port channel from the mandatory public hearing required to get an environmental clearance under the law . However, in September, 2016, the NGT quashed this environmental clearance as illegal, following which, the Goan local authorities decided the dates for the public hearings for the port expansion projects to be on March 20, 24 and 27, 2017 . The hearing was supposed to look at three projects separately: the first is the proposed terminal capacity expansion of two berths run by Jindal’s South West Port Limited to double coal imports to 14 million tonnes. The second is dredging of approach channel for Mormugao Port, and the third is the redevelopment of three berths that were contracted to Vedanta Resources by MPT in a public-private partnership. One of the three berths is ​ proposed to be ​ ​​ a coal terminal with a capacity of 7 million tonnes per annum. On March 20, 2017 close to a 1000 residents gathered at the venue of the public hearing which was big enough to accommodate only 300 people, and protested against the poor choice of venue for the environmental hearing of a project whose study area consists of 150,000 people. This resulted in the meetings to be postponed to 26, 27 and 28 April at Tilak Maidan, a football ground in Vasco . Finally, the public hearing which started on April 26, 2017 was the first of its kind for many reasons. First, it lasted 8 days, extended by an unprecedented five day; probably the longest in the history of environmental clearances in India, taking 82 hours in total, and lasting till 1am on the first night . Second, it was held with an unprecedented three-barricade separation between the chair and the public, and strict entry checks by the police, who prohibited participants from carrying cameras, hard disks and water bottles. Companies of the Indian Reserve Battalion and Goa Armed Police were on standby . Those who spoke up against the project included environment activists, engineers, lawyers, canoe fishermen, trawler fishermen, students, grandmothers, Roman Catholic priests, politicians from the Congress, Nationalist Congress Party, Aam Aadmi Party, fringe local parties, and even an MLA from the ruling Bharatiya Janata Party, amongst which there was not a single deposition in favour of the project, indicating that the Union government faces formidable resistance to its plans . A high school student Sherwyn Correia raised the issue of intergenerational equity . The proceedings from this hearing, which concluded on May 5, 2017, is now awaiting study by the Union environment ministry’s expert appraisal committee for infrastructure projects . However, Mormugao Municipal Council (MMC), which is the local municipal body of the town of Vasco, on 5 May, 2017 condemned the Mormugao Port authorities for making remarks against the people of Goa as outsiders and resolved to support the people of Vasco and state in opposing the expansion plans of the Mormugao Port Trust . Deepak Naik, the chairman of MMC said, ´´In today’s meeting, we have resolved that until MPT acts responsibly and provides proper justification and reply to the queries raised by NGOs, citizens and activists, no permission for expansion should be given to them. Also, they cannot control existing coal pollution so how they would control pollution after expansion, so it is best that they stop handling coal,” . Earlier during the hearing, the ex-chairperson of MMC Madeline Pereira, had raised doubts over a disaster management plan even being in place. Speaking about business at the coast of environment and health, she said, "Safety measures go for a toss when big ships come in with cargo. The focus here is on business and not environment or public health." . Project Details There are three separate projects: the first is the proposed terminal capacity expansion of two berths (5A and 6A) run by Jindal’s South West Port Limited to double coal imports to 14 million tonnes. The second is capital dredging of approach channel by Mormugao Port which implies deepening of the approach channel and inner basin for capesize vessels (the largest dry cargo ships which are bulk carriers of coal, ore and other raw materials) by excavating, and the third is the redevelopment of two berths numbered 8 and 9 and the barge berth of MPT which have been contracted to Vedanta  . Other No health survey done for correct assessment, but many respiratory diseases related to coal dust, such as asthma, breathlessness etc. Why? Explain briefly. 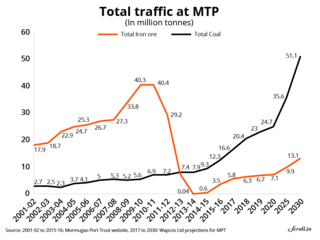 Although during the public hearing of the cases for expansion of the MPT, people vehemently opposed it, the decision is still awaiting in 2017on the fate of these projects, and Goa´s future as a coal corridor. The public hearing minutes will now be examined by the MoEF's Expert Appraisal Committee for infrastructure projects. They can decide to not recommend clearance to the project. Then it will land at the table of the environment minister himself, who can overrule the EAC's recommendation. So first level of outcome is that the government decides to not do the project in view of the public feedback. It is only if they give the clearance and someone approaches the NGT or the High Court that the conflict's outcome would be in courts. Report about high school student questioning the MPT expansion in terms of intergenerational equity. 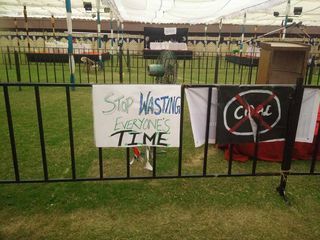 Report on how there is more pressure to allow coal passage in Goa from the PMOs, without scientific clearances.